We have been incredibly busy as we manage all the ins and outs of moving. It seems for every action-item crossed off the to-do list, twenty more eagerly pop up to fill its place. While I have been outwardly focused on all these necessary tasks, a part of me is aware that taking time to smell the roses with my boys is essential. Full Speed stopping to smell the roses when he was two adorable years old. In the midst of this craziness I am making an effort every day to be present for them and to keep up with many of our traditions. We have made it to the pool, the movies and for ice cream. These are the pillars of our summer. One day, as I contemplated the complicated logistics of our schedule, I had the strangest thought. 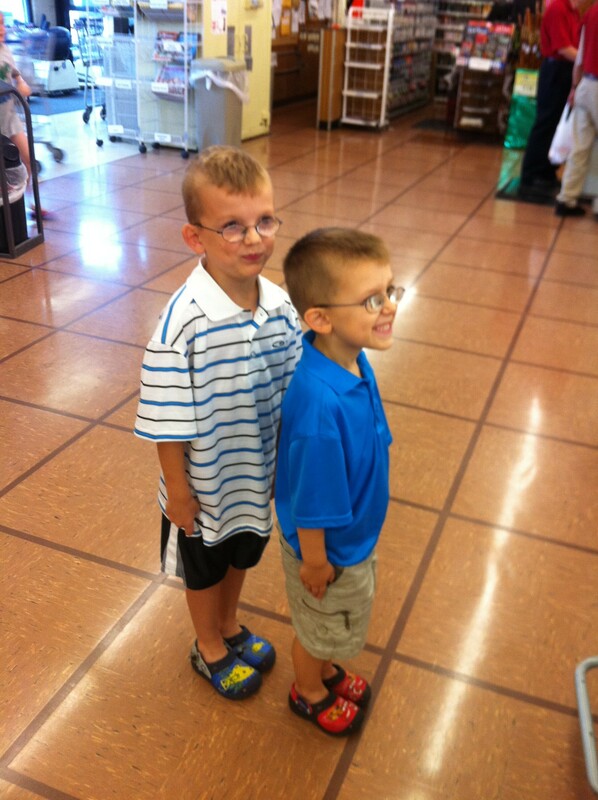 A Target run was first-up and I actually wanted my boys to go with me. Well, that was a first. I scanned my body for illness. Then I did a quick mental-health status check. I seemed to be functioning ‘normally’. Was this what end-of-days feels like? I do know that my boys are so much fun! They have the ability to entertain me while on errands and sometimes, they are actually helpful! All in all, not a bad day at the store. I don’t particularly like to resort to all out bribery to get my kids to behave. 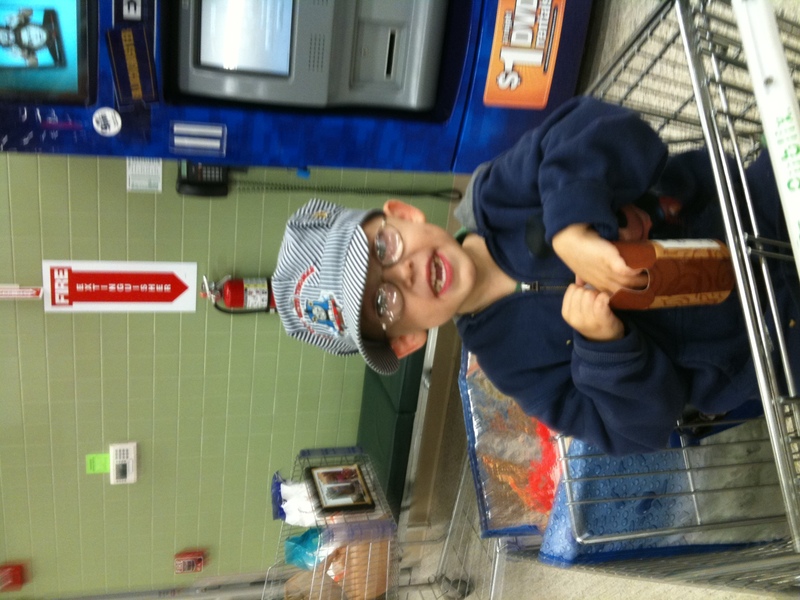 I also don’t particularly like to have my children’s pictures on the grocery’s red-alert watch list. 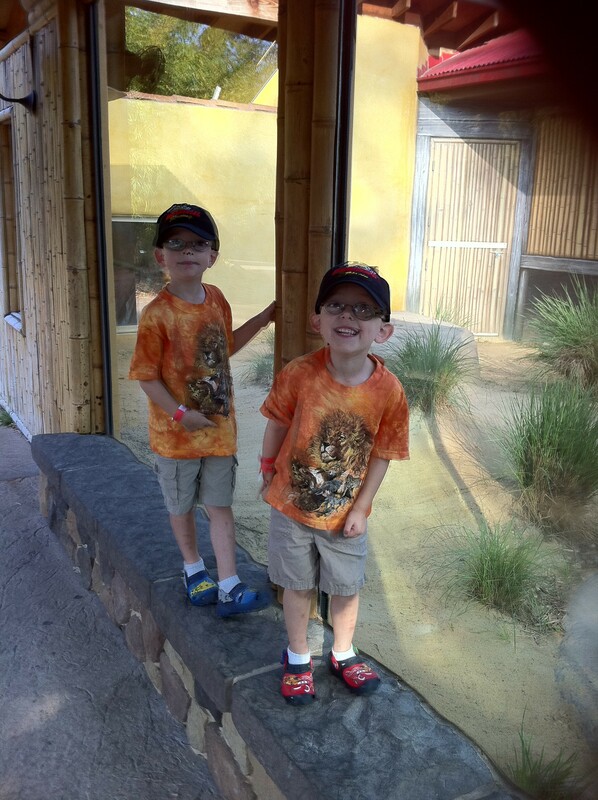 A while back I mentioned how Mad Dog and I were amazed at the substantial overall improvement of the boys’ behavior. This improvement is most notable when on public outings or surrounded by a large group. We attended a neighborhood cookout and our friend and host commented that she noticed a dramatic difference in them as well. For example, neither had to sit in time-out for anything. Neither tried to tackle, maim, bite or wreak generalized havoc on each other or the rest of the kids in attendance. Mad Dog and I actually got to sit back, relax and engage in adult conversation. All over cheeseburgers, good company and a lovely March evening. 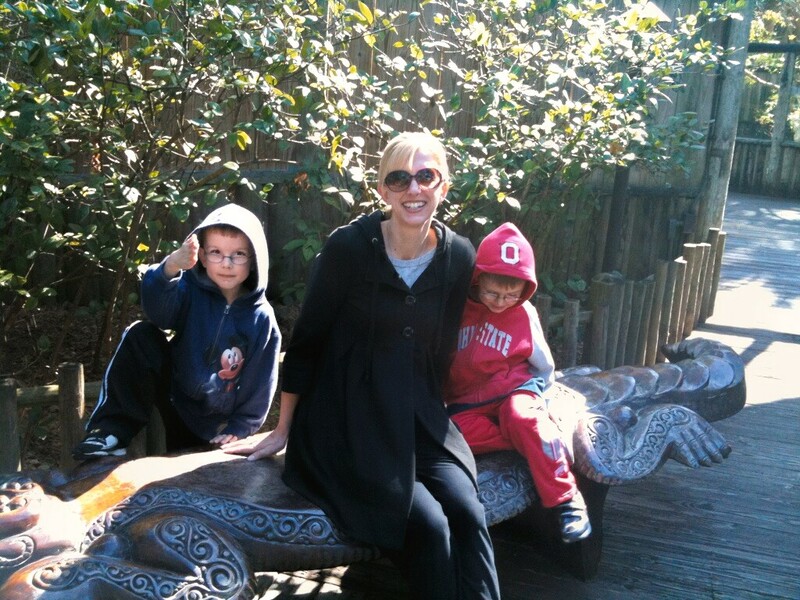 A spring break outing to the zoo where the boys continued their miraculous good behavior. They had cheeseburgers for lunch, too. Maybe the magic is hidden in the ground beef? More often than not, Mad Dog and I have these surreal moments, especially as a weekend draws to a close, where we look at each other in disbelief and say, ‘the boys were really well behaved, weren’t they?” It’s almost like we need someone to pinch us or that we need to thumbprint our kids to make sure that they are really, truly ours. When public outings for so long have been a battle ground, it’s refreshing when they simply become enjoyable. I didn’t see that coming at all. And, for those who read this blog regularly, I bet you didn’t either. 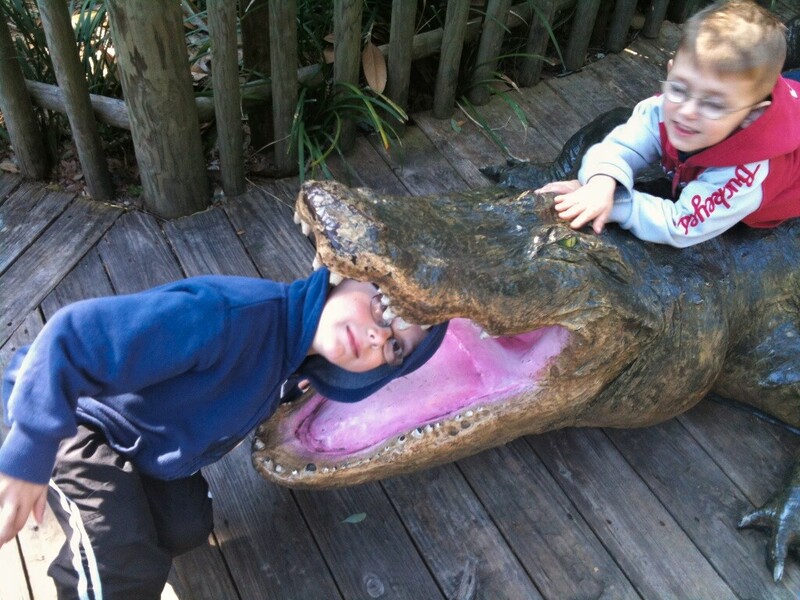 Fun at the Alligator Farm. Over the weekend Mad Dog and I had the rare opportunity to spend some time with only T.Puzzle. Full Speed went to Grandma’s and we kept T.Puzzle home. He had a runny nose and we thought he shouldn’t be around the dogs at Grandma’s because he is so allergic to them. Turns out, he rather enjoys being an ‘only’ child. He behaved like an angel at the grocery and when we purchased him some popcorn chicken (the real kind, not the Mad Dog invented version), he held it to his chest so lovingly, you could almost see a shiny aura of goodness surround him. When we got home, he said ‘Yes, ma’am!’ and ‘Yes, sir!’ to everything asked of him. I’m wondering if the best solution to surviving the terrible threes is to only have one child in the home during this difficult period. Any takers on Full Speed?